Several people have wondered why in the world would I add something like Usborne Books to my already busy life?!?! This is me at the Mother Earth News Fair in Belton, Texas in February. Isn’t my booth cute? As a retired educator with an instructional technology consulting business, Usborne Books & More may not seem to be the most logical choice for me. I have always loved reading books, learning from them, traveling through them, and immersing myself in the stories. Usborne not only values my educational knowledge and experience, they honor all the skills honed in my 20+ years as a professional educator. I am appreciated as a colleague, and I am rewarded for my contributions. I feel a rush of excitement every time I receive a new online order in my virtual store, someone requests to hold an event or the UPS truck shows up with a box of books. I feel all giddy just typing about it! This business fits into my very hectic life! I can’t be fired for missing work. If I want to ignore it and take care of my sweet husband like I did much of last year, that is fine. I didn’t make money when I didn’t work, but my business was there waiting for me when I came back to it. My book business is all mine to work as I wish. If I want it to be a hobby, I can work it just a little when I feel like it. If I want to build a career out of it, I can do that, too. It’s totally up to me. There is no glass ceiling. The more I sell, the more money I make. If I bring other consultants on board, I can make even more. I have seen men, women, people of every color, age, and ability level making this business profitable for them. Terice’s Bookstore is a nice counterpoint to EnvisionEd Consuting, LLC, my other business. EEC immerses me in providing appropriate technology education for our children, and Terice’s Bookstore allows me to put books in children’s hands. Each is an absolutely vital part of increasing literacy in our country. My Usborne colleagues and customers are incredible. I met some consultants last summer at the UBAM convention who have become true friends. My customer base now includes not only my friends and family, but their friends and extended families. I couldn’t imagine anything sweeter than having a business that includes all these wonderful people. I LOVE THE BOOKS and can’t go a day without sharing them. Now you understand why Usborne Books & More is so important to me! Feel free to comment or contact me directly if you have more questions. Contact me at TericesBookstore@gmail.com for info, and please, subscribe to my newsletter! Peace and love and happy reading to all. School starts soon for so many, and it’s time to support all of you with new devices in your classrooms. Now what? Here are a few practical tips to help you begin this exciting new year! Find 1 or 2 apps or web tools you want to start using. Learn the basics, teach your students what you want them to do with those 1 or 2 tools. Learn all the bells and whistles with your students as you discover together what they can do. Arrange your classroom so you can reach each student easily. Finally, have a wonderful year! Have fun! Laugh a lot, and make it work for you! If you are taking up 1:1 devices soon, think about what kind of receipt you want to give your students. After much brainstorming and trial/error, we came up with what we needed on our form last year when we took up iPads from students. Note: Our students took the iPads home all year. We were retrieving them for the summer to clean, repair, and prepare for the this year. We discussed what this form should look like and decided we wanted a form in triplicate. One piece to stay on the device, one piece to the person entering the info into the asset tracking system, and the third piece is a receipt for the student. Below we had an ALL CLEAR line. The student fills out his name, date, ID# and iPad #, but nothing else. Everything else was filled out when the student checked in the device. The forms were printed and cut, four to a page, by our district’s print shop for a nominal cost. They worked out well, and it was great to have 3 copies so multiple people could work with the information simultaneously. Hope this helps! If you want a copy of the form we used, just comment below and I will email one to you. As Vicki Ventura and I have visited teachers and administrators from multiple districts throughout the last several months, we are consistently surprised that these beliefs about iPads in the classroom still exist. MYTH: The iPad is a consumption device, especially in the early years. It is not a creation device. TRUTH: Even the youngest children can create on an iPad. 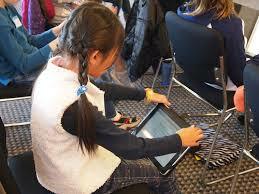 We have seen very young children create pictures, edit photos, and even create video. It may not be the highest quality product that they produce, but it is age and developmentally appropriate. MYTH: You can lock down an iPad so that no one can delete the profile or reset it. TRUTH: At this time Apple does not allow districts or any entity to lock down a device so that it cannot be reset. A student must simply connect to a Mac to reset the device. Apple says they are working on an enterprise solution to help districts with this issue. MYTH: Once teachers have iPads in the classrooms, student-centered lessons will increase exponentially because the students know what to do. TRUTH: Staff development, collaboration and support are key for successful implementation. Students know the devices, but teachers may not. 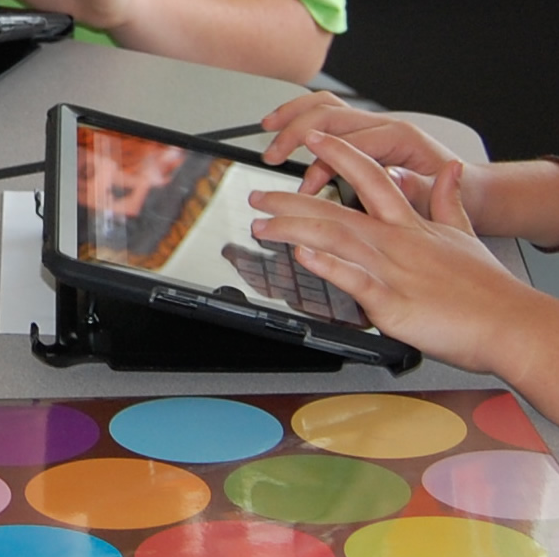 While the iPad is a powerful classroom tool, it will not be used effectively if the teacher is not comfortable with students using it. Even the best teachers need help to change the classroom environment to student-centered. 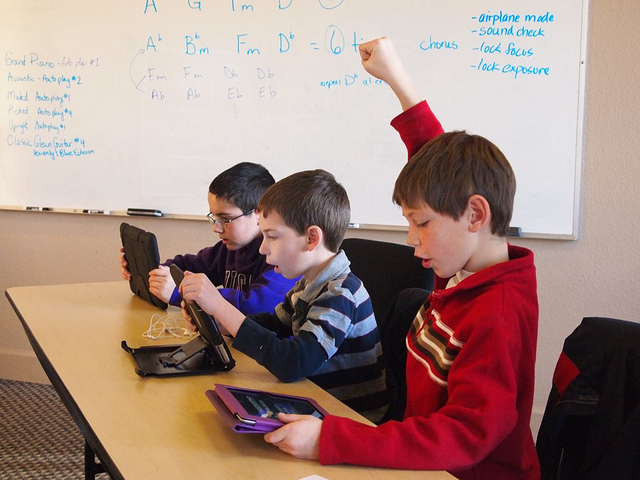 Teachers have to be supported, both technically and emotionally, in the use of iPads or any new technology as a vehicle for change in their classroom. If you have a myth to add to the list, please share it in the comments. Photos taken by Lexie Flickinger. This month has been a blur of learning! It started with EdCamp in Round Rock, Texas, on Feb. 1 where I heard from educators who sometimes struggle and sometimes succeed in doing what we all want: integrating effectively, using the best tools for the job, and engaging students. Teachers told of taking the best of what they had learned and tweaking it for their particular situation. Google Apps for Education, Twitter, Facebook, and the Flipped Classroom were explored with passion and thoughtfulness. TCEA14 began two days later in Austin, and I saw incredible presentations on the same topics as the small but powerful EdCamp. The convention center was teeming with educators who want to do the best thing for their students. I saw Paul Simon and Sting together in concert in Dallas just two days after TCEA14 ended. These singer/songwriters own different styles of music and delivery. I have heard that they previously did not like each other, but they figured out that they share something vitally important to each of them: passion for music and songwriting. They sometimes shared the stage singing together, sometimes sang solo with their combined bands. And it worked beautifully. Each retained his own style, yet they were able to sing together with obvious respect and care on Sting songs and Simon songs. It was an unforgettable 2 hours and 45 minutes of incredible music. I’ve been thinking about all I have seen so far this February, and it has hit me AGAIN~I seem to re-learn this frequently~ we all share the passion for our craft and want the same thing for our students. Our styles may be different, but so what? Each educator takes what he can from the others and then uses his best strengths to meld the new learning into something just right for their classroom. So the flipped classroom sounds awful to you? Or maybe you hate social media of all types. That’s okay. You can find something to incorporate without losing your identity and beliefs. Learn from one another, and then take away and tweak what works for you. Remember, we are more alike than we are different. You can be Paul Simon or Sting…and still sing together without losing anything of yours. My goal is to continue to look for teachers using new tools and techniques to pass along, not so you can copy them, but so you can take something new, do what you do best with it, and make your classroom even more engaging.